Chinese winter 'cooling' world economy Jump to media player There are growing fears about the health of the global economy after a day of market turmoil. Osborne warning to 'sleepwalking' EU Jump to media player The Chancellor George Osborne tells business leaders Europe has to carry out reforms to avoid "sleepwalking" into a future where it has priced itself out of the global economy. Davos focus turns to climate change Jump to media player Climate change poses huge potential risks to global economies and will be high on the agenda at Davos. China slower growth casts its shadow Jump to media player China's economic strength is crucial to the health of the global economy, and especially to its neighbours in the Asia-Pacific region. The oil price drop - in 90 seconds Jump to media player BBC News looks at why oil prices have been falling, and what the impact has been. How will fall oil prices affect economy? Jump to media player Why failing oil prices is good news for motorists but could affect jobs, inflation and politics. Obama 'forgot to bring lederhosen' to G7 Jump to media player President Obama has said the leaders of the G7 nations will discuss "standing up to Russian aggression in Ukraine". 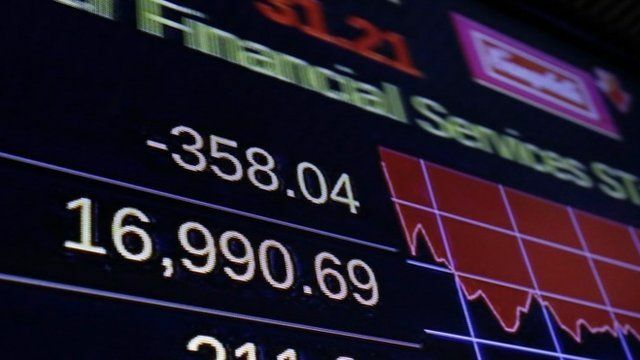 There are growing fears about the health of the global economy after a day of market turmoil. Across the world share prices and currencies have fallen and the London stock exchange has dropped to its lowest level for seven months. The slowdown in China, the world's second largest economy, is being blamed. The BBC's economics editor Robert Peston examines the prospects for the world's economy.